"The best things are worth waiting for." That's how travel blogger Sonja Lishchynski summed up her recent engagement on her blog MonteCristoTravels.com. Trust us, to say that Sonja is a patient woman would be a gross understatement. To say that she is a perfectionist would probably describe her much better. After all, she waited 18 months for a retired Hungarian jeweler to hand craft the ring she was going to propose with because she wanted it done "the old way." And if you think that's romantic, just wait until you find out why she insisted on having the ring done by hand and not laser, which would have taken way less time. You see, her fiancé's name is Stefan Dumas. That last name must ring a bell, doesn't it?! And no it's not just a coincidence, Stefan is actually a descendant of Alexandre Dumas, one of the most widely read French writers and author of The Count of Monte Cristo and The Three Musketeers. When Stefan's family moved to the New World, the Dumas signet ring went inexplicably missing. Then nine years ago, when Sonja and Stefan were still in a flirting phase, he mentioned to her that one of his biggest regrets in life is not having that ring replaced. So when she decided to propose, she embarked on a true adventure through history. She contacted La Fondation Dumas and the Paris Archives looking for any clues as to what that ring might have looked like. Then, she found a Hungarian jeweler in Vancouver who, after hearing Sonja's story, agreed to come out of retirement (he is in his 80s) to make Stefan's ring. "You know, I haven't done this in a really long time," he told her. "And I have to work really slowly because I have really bad Arthritis. There's only so much I can do in one go and then take a day to recover. So I can't tell you how long this is going to take." Her response? "Take. Your. Time." When the ring was finally ready, it was just a matter of waiting for their trip to the Czech Republic's capital which, by the way, is not just some random place Sonja picked. "I am obsessed with architecture and how cities have evolved," she said. "And Prague is unique in the world. It has managed to escape the grid system that Napoleon implemented pretty much everywhere he went. So, as a result, Prague has this wonderful ability to allow lovers get lost in its tiny little winding streets that were never designed for cars. So for me, Prague maintains that true sense of what we would call a fairy tale." Did we mention Sonja is a perfectionist? Because she wanted to capture the beautiful moment she proposed to Stefan on camera, she had arranged for Berlin-based photographer Sarah Stein to join the couple for an impromptu shoot in Prague. But how do you not raise suspicions that something else is going on when you have a photog follow you around in one of the most beautiful cities in the world? This is where Sonja's patience and perfectionism proved very useful. She wanted to keep the proposal a total surprise, so while the ring was still being made, she organized a photo shoot for the two of them in Dubrovnik through Flytographer, a photo service that connects you with local photographers around the world who basically take photos of you and your significant other while you are sightseeing. The goal? 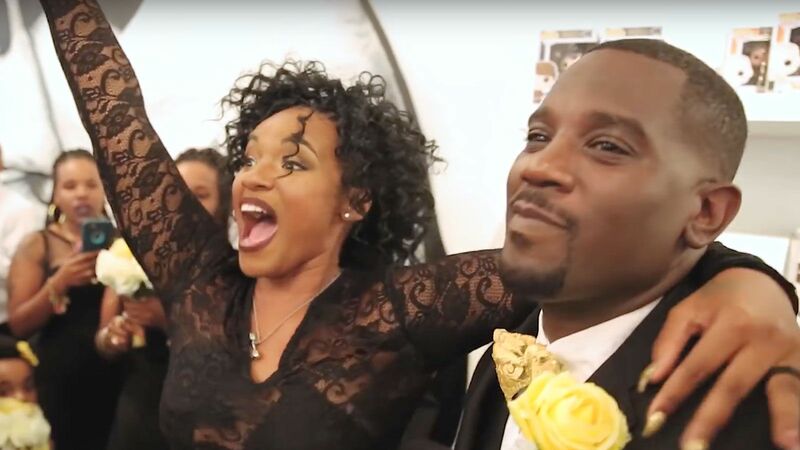 She hoped he would love the results so much that he'd agree to two sessions per year—so when the time came to propose, he wouldn't be surprised by a person with a camera following them. Good one, Sonja! 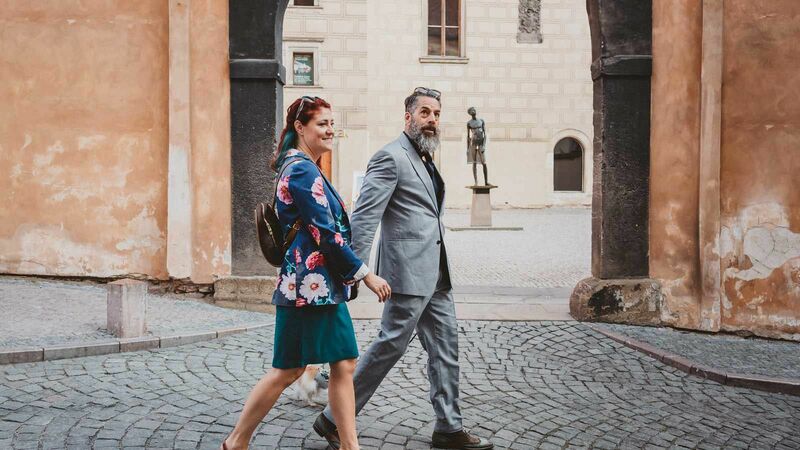 Fast forward to about a month ago (September 14, to be exact) when Sonja and Stefan were in Prague all dressed up for their friends' nuptials when she suggested they go for a romantic sunrise shoot around the capital. When they finally reached the "secret place" Sonja had picked, she went down on one knee and popped the question. You probably noticed the pooch in the photos. That's Monte Cristo, Sonja and Stefan's "child." They travel with him everywhere and she says it was very important for him to be present at their engagement. And you thought the whole story couldn't get any cuter!